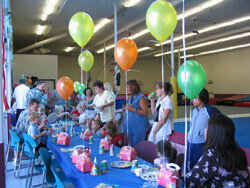 Birthday Parties at Aerial Tumbling and AcroGymnastics are great fun for kids, and entertaining and relaxing for parents. Our party specialists know how to make parties a blast with age appropriate games, races, obstacle courses and other creative activities, and of course, kids get plenty of free play time to do what they love to do …BOUNCE, while parents can relax, visit and enjoy watching the kids play. Best of all, you won’t have to fight the crowds since your party is PRIVATE! Party hosts may arrive 15 minutes before the scheduled party for setup. Tables, benches and a solid colored table cloth will be set up beforehand and you can decorate with whatever balloons and party supplies you like. You are free to bring whatever food and refreshments you would like to serve. (Host has access to a refrigerator and freezer) Our party host will take over for an hour of fun and games in the gym area. The remainder 30 minutes of the party is spent in the party area and you’re free to entertain as you please (pizza, cake, ice cream etc..). When it’s over YOUR HOUSE is still intact and all you need to do is throw away your garbage, take your loot, and go home and relax. To Book a Party, Register Online or call the front desk. You will be contacted within 48 hours to confirm options. Once confirmed, we will charge the card on file. Enter email address as your login ID. You will be sent an email with a temporary password to utilize the Customer Portal. We encourage you to change your temporary password to a personal password after your initial login. If you ever need help with your account or logging in to the Customer Portal, please email info@atagymnastics.com or call the front desk at 408-224-5437. Love gymnastics & looking to try something NEW? Try our brand NEW Acrobatic Clinics! The clinics will be led by one of ATA’s Acro Team coaching staff. Athletes will learn skills on pedestals, build human pyramids, learn basic acro stunting & play fun acrobatic games! Each clinic will be a new experience, since every mix of athletes lends itself to different types of pyramids & challenges. Sign-up for one or sign-up for all of them! Open to all Nov-PT students! Non enrolled students must first come in for an evaluation. ATA will be hosting a Parent’s Night Out for students and their friends ages 3-12. Must be potty trained! Our experienced and safety certified staff will organize games, relays, crafts, and supervised free play activities for your kids. Pizza will be provided.They’ll have so much fun they’ll be begging to come back!!! Click here to register. Space is limited. ATA Gymnastics provides a healthy, fun, and safe environment for your child to improve movement and body awareness, build flexibility and strength, and learn gymnastics. Copyright ATA Gymnastics. All Rights Reserved.